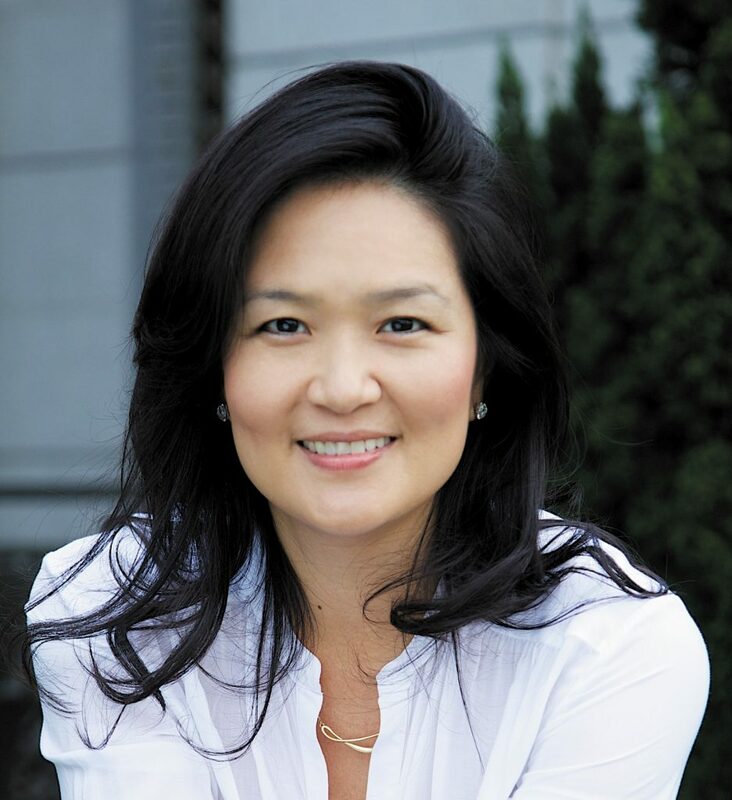 The Expatriates is set in contemporary Hong Kong and is about three very different women living in the American expat community, but I think it is mostly about the bonds of women and motherhood. Expats in Hong Kong can live a rarefied life of cocktails and dinner parties. In my novel, Hilary Starling has a dinner party where her life starts to unravel. Right before, as if she can sense the impending chaos, she lies in bed, unwilling to get up. At least, there is delicious food on the menu, including this Peking Duck Spring Roll. 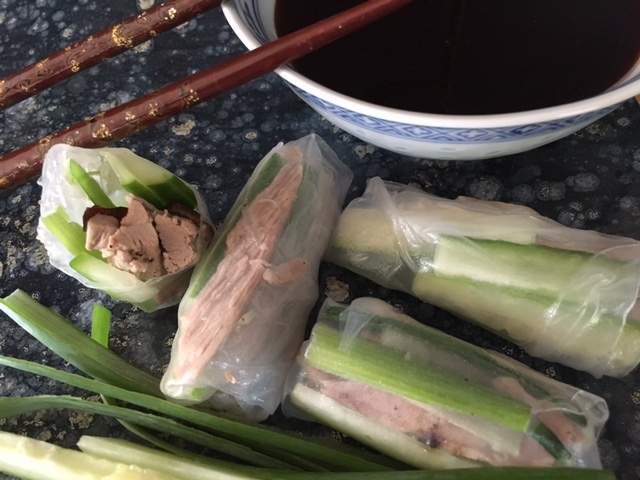 These spring rolls -- tender chunks of duck and crunchy vegetables in a soft rice wrapper with a soy dipping sauce -- pair with Janice Y.K. 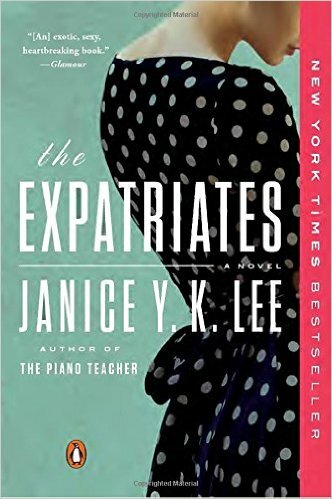 Lee's novel, THE EXPATRIATES. PREPARE THE DUCK: Prick the duck all over with a small knife or fork. Rinse duck in water and pat dry with paper towels. Place the duck on a rack in a roasting pan. Sprinkle with salt and pepper and leave in the roasting pan until ready to cook. In a small bowl, whisk together the honey, five-spice powder, soy sauce, brown sugar, and 6 tablespoons of water. Brush the duck all over, inside and out. Let dry for about 10 minutes and brush again. Repeat this process until you have used all but 4 or 5 tablespoons of glaze, and reserve this glaze Ideally, let the glaze marinate overnight on the duck, leaving it uncovered in the refrigerator. Preheat oven to 350 F. Place the duck in the oven and cook for 45 minutes. Flip the duck over, baste with the reserved glaze, and cook until the skin is crisp and golden brown, another 45 minutes. Check halfway through cooking that it is not getting too dark. If it is getting too dark before half the cook time is up, turn down the heat and lower the rack in the oven. When the duck is cooked, remove from the oven and let rest while you make the dipping sauce. MAKE THE DIPPING SAUCE: In a small bowl, mix the cornstarch with 1 tablespoon cold water and set aside. Heat a pan or wok over medium heat and add the hoisin sauce, sugar, sesame oil, and soy sauce. When the sauce starts to bubble slightly, add the cornstarch mixture and stir well to thicken. Set aside and let cool. MAKE THE ROLLS: Place one rice wrapper in a shallow bowl of hot water until softened, then lay it on a damp tea towel. In the center of the wrapper, add some duck, crispy skin, scallions, and cucumber. Fold in the sides of the wrapper, fold up the bottom, and then roll. Repeat with the remaining wrappers. Serve immediately, with the sauce for dipping.